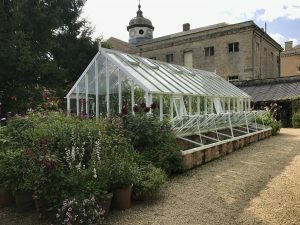 A few people have asked me about “Container Gardening” (that’s plants in pots, in case it sounds technical), so I thought I should write an initial piece. It’s a huge topic and there are many experts who can help you along the way, so I would always encourage you to look, and read, around. There are also a number of reasons you might use containers, like having a balcony or patio instead of a garden, or enhancing your garden with ornamental pots. I’ve tried to distill this to my five Top Tips, to cover this range of situations. This will always be my start point. Don’t just fill pots with soil from a garden – it will have weeds and stones in it and may not have very good structure for your plants. Buy bags of good quality compost, not the garden centre own brand which I often find contains a lot of unrotted material or weed seeds. My current favourite is Melcourt SylvaGrow, which is a peat-free multipurpose compost. Traditional John Innes No 2 is good for more mature plants, trees and shrubs. If you are planting cacti or succulents, get a specific mix for these – it will contain a lot of sand and grit to help water drain away and that’s essential for these plants. Whatever containers you choose, make sure they have holes in the bottom, or an inbuilt reservoir (the label will tell you if it has this). If your container has holes which are 1cm or more in the bottom, it’s a good idea to use crocks (bits of old broken pot) or stones over these holes so that your compost doesn’t wash out when you water. Pots without holes may seem tidy and good for holding water, but if you overwater or there is bad weather, your plants will be left in a swamp as the water will have nowhere to go. If you do choose a container with no holes, then fill the bottom few inches with grit as this will make reservoir for additional water. If you are wanting a very formal look – for example a topiary plant at the side of an entrance way – then single or matching pairs of pots are fine. However, if you are making a “container garden” your pots will usually look better and more natural if grouped together. You can use several of the same kind of pots if you want a uniform look, you can carefully choose pots which complement each other (eg similar colours or styles), or you can just gradually build up a whole range of different pots and create an eclectic mix. Grouping your pots will give more of an appearance of a “garden”, as you will be able to nest a lot of plants in the same area. You can also build up height by putting some larger, taller pots at the back, hidden by medium sized and small pots at the front, which will give a more complete, natural look to the planting. 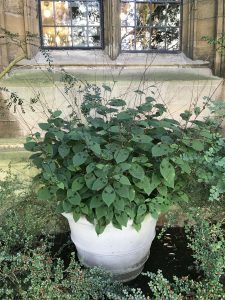 There is another reason for grouping pots, and this is that a group of plants will create a microclimate – preserving a cooler, moister atmosphere during hot months than a single pot would have. One Kind of Plant in a Pot, Or Many? You will be able to find a lot of tutorials online about planting stunning display pots: The kind which have a large central plant, surrounded by medium sized plants in a complementary colour, and then small or trailing plants round the edge. These can be amazing, particularly if used as a focal point in a garden, or if you only have room for one or two pots, or window boxes, and want a range of plants. If you are buying plants to make a combination in a pot, put them next to each other when you are at the garden centre or nursery and see if they go well together before you buy. If, however, you are making a display with several pots, dedicating a pot to each plant, or type of plant can be easier and create a better effect. Each pot can create its own splash of a particular colour or texture, and you can rearrange the pots as much as you like to change the effect or to show off whatever is looking best. With a group of pots, you can use larger pots for some “structural” plants which will form the backbone of your container garden – for example an evergreen shrub like a conifer, holly, or hebe. You can then fill medium and small pots with plants to add a bit of pizzazz. In case you are wondering, the dictionary definition of pizzazz is “an attractive combination of vitality and glamour”. Using both evergreen, leafy plants and seasonal flowering plants and bulbs will add important combinations of texture and colour to your containers. 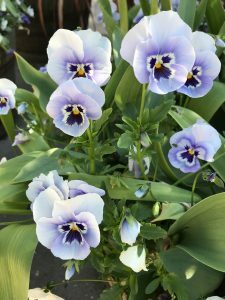 Over the years, I have learned not to ignore the charm of some common “bedding” plants in pots – such as pansies or petunias – as these can give a vibrant splash of colour. Bulbs will only give a few weeks of interest, but they are often happiest in a pot. I sometimes plant tulip bulbs in a pot underneath winter bedding plants in the autumn, and then have a pot which gives winter flowers, followed by taller spring blooms. Plants which are houseplants in the winter, like cacti and succulents, can come outside in the summer to add an extra dimension to pots on a balcony or patio. You can also grow vegetables in some of your pots and use these both to add more colour and to eat: There is no reason not to include things like lettuce, beetroot, chard, herbs and even exotics like chillies in your pot display. Careful watering is the key to success with container gardens. You need to make time for watering – every day in hot weather. If you are going to be away for a period of time, you can try standing pots in some extra water for a few days, or arrange for someone to come in and water, just like having someone in to feed a pet. Check whether your pots need watering by feeling how dry the compost is, or lifting up smaller pots to see if they feel light (and therefore contain no moisture). When watering, don’t just give a trickle, give the plants a full drink – as if filling the pot with water. It is best to leave around 2cm between the compost and the rim of the pot when putting in your plants, as this will allow you to “top up” a good amount of water. You will also be able to see if the water is settling on the top – indicating that the pot is now saturated with water. If no water runs out of the bottom of the pot after saturation then – go back to point no. 1 – you have a problem with drainage and may need to repot. 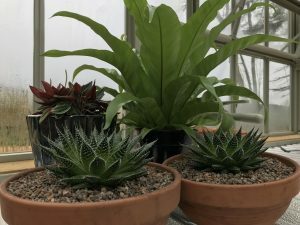 This is a really interesting read; as someone who moves regularly, I keep a lot of plants in pots and there’s some valuable advice here to help ensure I’m maintaining the plants correctly. I also bring my succulents outdoors for the summer and they have thrived. Thanks Kate. Thanks Sara. I’m glad you found it useful.